Thursday, June 21st, 5:30-7:30pm. Jimmy’s Grill, 245 S Washington St, Naperville. 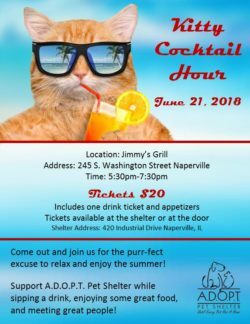 One ticket ($20) includes 1 drink ticket, appetizers and lots of fun socializing with other pet lovers. Come out and join us! Tickets available at the shelter, 420 Industrial Dr, Naperville, or at the door.